Iola Car Show where we are paid for our efforts along with more than 135 other non-profit organizations whose members volunteer. Since 1991 we have planned and staffed the Special Exhibit section of the show, which involves displaying 200-300 vehicles (up to 50 for exhibition inside the former Krause Publications building) and selecting vehicles for the official poster and a variety of other promotional and collectible items including pins, buttons and model car banks. 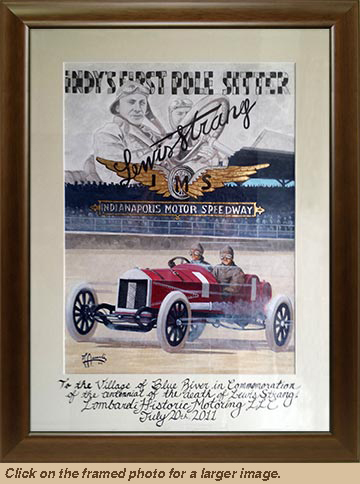 We sell these items for the Iola Car Show in the Special Exhibit area where we display our SAH/WSAH banner and promote membership along with answering questions about the show and automotive history. 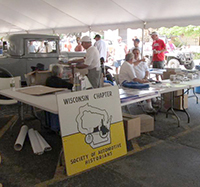 For several years we have given monetary support to the Wisconsin Automotive Museum, have donated to various Wisconsin historical projects, and have sponsored benches for the Old Car Show. Most WSAH members will recall our 2015 donation to the Milwaukee Public Museum for encasing the Schloemer Motor Wagon in the “Streets of Old Milwaukee” exhibit. 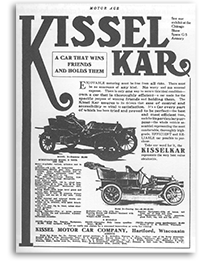 This brief article is an attempt to summarize information from several sources on the Schloemer, including our own Wisconsin Cars and Trucks book, the Standard Catalog of American Cars 1805-1942, and various newspaper and other articles found online.